The 2017 Forrester Wave for Data Management Platforms has recognized Neustar with the prestigious designation of Leader. Identity resolution is at the core of everything we do, and Forrester cited that as a strong reason for marketers to consider implementing the Neustar IDMP into their marketing stack. The recognition comes on the heels of several new deployments of the IDMP in North America and around the world. Brand advertisers are continuing to embrace trusted and responsible identity resolution as a means to be more efficient with their marketing spend. The IDMP is an unparalleled and complete end-to-end data management platform. From onboarding 1st, 2nd and 3rd-party data to segmentation, targeting, activation, all the way through to analytics, Neustar gives organizations the power to understand and connect with actual people. Measure smarter, and optimize faster with data-driven intelligence that's based on truth and cemented in reality. 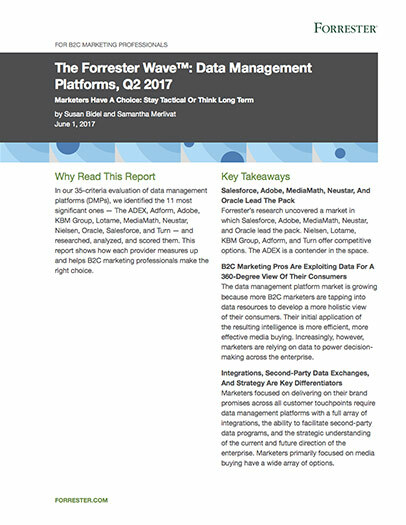 Get your copy of the Forrester Wave™: Data Management Platforms, Q2 2017.